The photograph accompanied a New York Times story on how climate change can cause endangered ecosystems and species to migrate from the nature preserves designed for their protection. 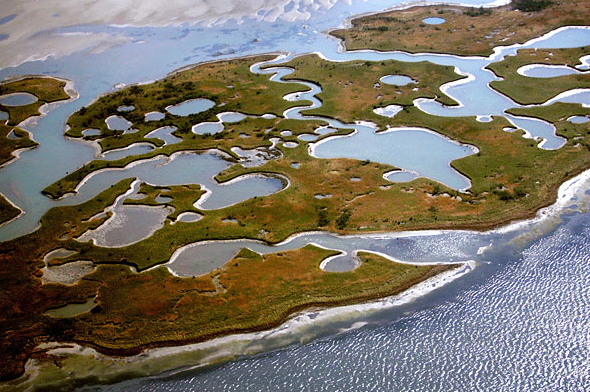 So it is that the Chandeleur Islands that you see here might go under water entirely, taking a bird habitat with them. The story spoke of the “preservation predicament,” but environmental advocacy faces a continuing rhetorical predicament as well, which is that it is difficult to provide definitive examples of systemic change. So it is that every cold snap produces sarcastic jokes about global warming, while every heat wave can be discounted as merely a local phenomenon. Nor can this photo do the job: although water is overtaking the land, that’s what you might expect of low-lying barrier strands. And isn’t it more aesthetically interesting because the water is there? But let’s back up a bit. Forget about documentary evidence. The image is beautiful, and not just typically so. This is not what you expect to see in either landscape photography or at the seaside. Instead of nature’s wonder spreading beyond our limited horizon, here we look down from above. That god’s eye view makes what is in fact a geological landform look like an ornament. I saw not islands so much as a piece of artisan jewelry. Instead of water, recently molten metal; instead of land, delicately wrought ceramic; instead of accident, design. The point is not that you should see it the same way. But to see the island as a thing of beauty is to grant it special status as a good thing. And it will be a good thing regardless of any calculation of utility, whether by a real estate developer or an environmental protection group. And if it is a good thing because of its beauty, then we should appreciate that this beauty comes from its inherently variable and fragile nature. Neither sea nor land nor sky, the image gives us these things in precarious equilibrium. The message is not that the earth is warming or that change is inevitable anyway, although either conclusion can be drawn. No, the photograph says something more basic: This is a beautiful planet. Admire it. Love it. Photograph by Robert F. Bukaty/Associated Press. For an earlier post on aesthetic design in nature, see The Photographic Cosmos. The beauty-is-good idea was a stock item in the Renaissance; see, for example, Castiglione’s Book of the Courtier.